It wasn’t too long ago, during a SE Voluntary Sector Forum meeting, that myself, and a group of willing volunteers agreed to help organise a networking event for the South East locality. The purpose was simple; we all needed to become better connected to improve the services we provide for people living in the South East. We wanted to create an event where people could connect and find out what is already there. Our first planning meeting consisted of a group of 6 and a print out of a google search “How to organise a networking event”! And that is where we started. 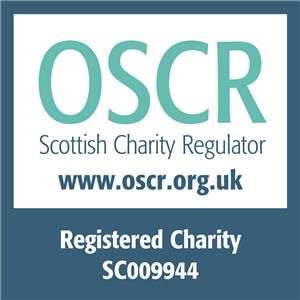 Our audience was third sector organisations, NHS and City of Edinburgh Council (H&SCP) and our goal was to reach as many people as possible working in South East locality. As a team we chose a date and venue and sent out Save the Dates. Between our networks and with the help of our enthusiastic public health practitioner, Sylvia Baikie people very quickly began to register their interest. And as we continued to meet and plan the scale of event became bigger and bigger. It became apparent was that the SE really needed this event. Everyone was ready to connect. On the day, we had over 35 stalls set up around the perimeter of the conference rooms in Faith Mission. We had happy helpers ready to welcome guests as they came in. Health in Mind had lovingly prepared welcome packs for everyone attending. 113 delegates had booked on and a further 89 people registered on the day. There was a queue out of the door! The first half an hour was good old fashioned networking. People were able to peruse and chat to the stall holders. We had deliberately allowed for this time so that guests who only had limited time could pop in. 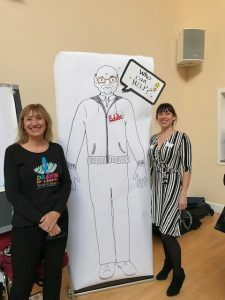 Sylvia Baikie then kick started the main event by walking on to the stage with a life size pop up drawing of Eddie. Eddie was a reminder of why we need to network of why we were there. He is a visual representation of an individual in our locality who needs us to work together to better support his needs. In fact, Eddie wasn’t the only image of the day. Throughout the event, standing at the front with a huge board and beautiful coloured pens, was Jackie Forbes a graphic facilitator from Drawn to Learn. Drawn to Learn brings group thinking and conversations to life through the magic of graphic recording and visual maps. Amazingly this was being done ‘live’ throughout the whole morning. The first part of the event was the presentations. It was a great way to set the scene and show how the pieces of the jigsaw puzzle fit together. After this followed the networking activity / ice-breaker. Before the event we had thought hard about we could maximise networking and we decided on BINGO with a twist. In the welcome, pack were our case study bingo cards. There were 9 different scenarios and each was representative of what people may be facing in our locality. We asked our attendees to find a professional or service who could support each of the case studies, allowing them to fill in some gaps and think outside of the box. No particular rules – just to speak to someone new. Theoretically, each person in the room should connect with 9 others! We really couldn’t believe how everyone made the most of this opportunity. There was such a buzz in the room; it was incredible! In fact, once everyone had started talking it was difficult to get them to stop. We came together to discuss what new information we had found. People were happy to share the new support systems they had discovered and organisations were given an opportunity to tell everyone a bit more. We then focused in more detail on our friend Eddie and collectively found a more comprehensive support system for him. In small groups the delegates brainstormed on two other scenarios in more detail. All their suggestions of support were put on post it notes to be captured on the graphic recording after the event. The last part of the event was back to the stalls for general networking. Again opening the doors to professionals who were only able to pop in. If I was to use three words to describe the event, I would say ‘BUZZING’ ‘OPEN’ and ‘POSITIVE’. The feedback of the event was incredibly positive. People valued the networking opportunity and really made the most of it. The graphic recording was sent to delegates as a summary of the event along with a directory of nearly 200 contacts. We were so happy to hear of new connections being followed up and it really feels like the South East are in the zone to work together. “Recording the minutes visually was a really interesting and useful method. Having time to network with so many organisations was brilliant”. The whole experience of organising an event like this with such a positive group has been fantastic. Everyone worked so hard and we all pulled on our joint resources. The event itself was an example of what can be done when we work together. Personally, leading an activity for so many people was a new challenge and something I am really proud of. The next Who’s Who event will be organised by Health & Social Care and is hoping to build on this momentum and keep strengthening ties in our locality. Blog first published on the pages of Edinburgh Community Health Forum here.